A poster put out by the U.S. Children's Bureau in 1918. Julia Lathrop, a longtime social reformer in the fields of education, mental health, child welfare and child and maternal health, became the first chief of the U.S. Children's Bureau in 1912. But it wasn't always so. A century ago, many new parents were just as eager for authoritative, trustworthy advice, but there wasn't that much of it around, especially for women isolated from extended family by oceans or frontiers, or for whom poverty made doctor visits a luxury. As head of the United States Children's Bureau, Lathrop was used to getting letters from mothers asking her advice. She was also used to helping people in difficult situations. Before being named the first director of the agency in 1912 (and long before women got the right to vote in the U.S.), Lathrop had worked closely with other leading social progressives, including Chicago's Jane Addams. Both were deeply involved in creating and running Hull-House, a settlement house in that city that provided good food, education, contraception and other services to the city's poor. 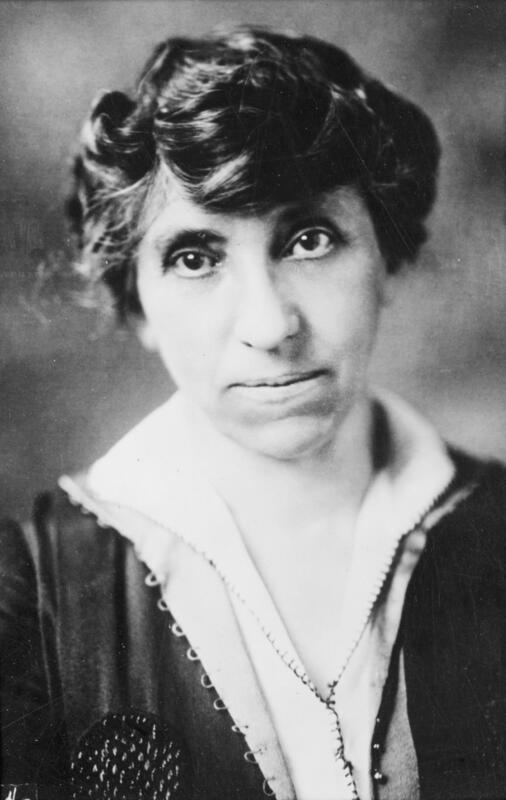 Vassar College historian Miriam Cohen, author of Julia Lathrop, Social Service and Progressive Government, says Lathrop became "really passionately concerned about poor children" during her years at Hull-House. She eventually went on to help in the creation of the juvenile justice system. When Alice Phelps' moving letter arrived in Washington, it apparently made a deep impression on Lathrop: Phelps told of riding miles through subzero temperatures to help a distant neighbor who was in the throes of a birth that had gone terribly wrong. Lathrop heard this cry for help and wrote back to Phelps that her letter "makes very urgent the great question of protecting motherhood." But what could Lathrop do to help women like Alice Phelps? Her agency wasn't designed to provide health care. In fact, it had very few resources and had been created with a narrow mission: to conduct research. Historian Kriste Lindenmeyer, dean of Arts and Sciences at Rutgers University-Camden, says the Children's Bureau grew out of an idea that was still very new at the time: that the U.S. government should have a role in the welfare of the nation's children and families. "The federal government had dealt with economics and building roads and bridges and trade, but certainly not social welfare issues," says Lindenmeyer, author of the 1997 book A Right to Childhood, The U.S. Children's Bureau and Child Welfare, 1912-1946. But by the late 1800s, Lindenmeyer says, the nation and the needs of its citizens were quickly changing. The population was growing — 12 million immigrants had entered the country between 1870 and 1900 — and more and more people were moving from the countryside into the cities, and rejecting the old ways of doing things, Lindenmeyer says. Science and "modern medicine" were advancing in public esteem. "Americans thought of their country as a very modern and industrializing country, in fact the model for the rest of the world," she says. Striving for modernity, perhaps, but many Americans' lives were a downright struggle. Lindenmeyer ticks off the widespread social problems of the early 20th century: "Poverty, poor sanitation, ignorance of modern health practices, parents who don't have access to good care or information." And child death was a fact of life, in those days. In 1915, one out of 10 white infants in the U.S. and one of every five African American babies died before their first birthday, says Molly Ladd-Taylor, an historian at York University in Toronto and author of Raising a Baby the Government Way: Mother's Letters to the Children's Bureau 1915-1932. Babies died in the summer," Ladd-Taylor explains. That's when food, especially milk, was more likely to quickly spoil or become contaminated and cause gastrointestinal illness. Equipment used to process food was more likely to carry and spread bacteria then, too. "It was a given reality that there was nothing to do — [that] it was God's will," Ladd-Taylor says many people figured at the time. Babies died, and to try to change that, some thought, would have meant challenging nature. Increasingly, Americans were becoming aware that many children lived and worked in awful conditions — and that wasn't something they were proud of. Lindenmeyer says social reformers of the time — mostly well-educated women who were often unmarried and childless — took up the cause, arguing to lawmakers that children are a national resource, and that if America's leaders didn't soon do something to help the next generation thrive, the future of the still-young country was at risk. The social reformers were blunt — criticizing lawmakers who could spend tens of thousands of dollars fighting the boll weevil but couldn't find the money to invest in the nation's children. Roughly 30 percent of the deaths in America in those years were of children under the age of 5. Some historians estimate that the annual number of deaths of very young children in the U.S. around that time ran as high as 300,000. Ladd-Taylor says that may be an underestimate; births weren't even registered in many parts of the country then. There was a groundswell of support, Lindenmeyer says, "calling for the establishment of a federal agency that would focus solely on the needs of the nation's children and youth." 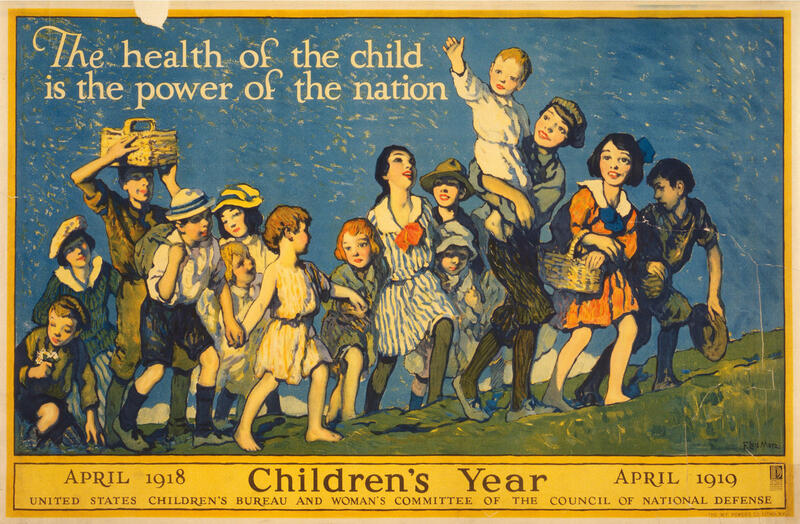 In 1912 the United States Children's Bureau opened its doors, founded on the idea that children are a national resource. Lathrop, the bureau's first director, soon commissioned several studies to investigate the causes and conditions of infant mortality. She wanted hard data to dispel the notions that child death was inevitable or an act of God, and to prove that infant mortality was not about genetics but rather environment. Ladd-Taylor says some mothers even submitted samples of the baby's feces on a piece of cloth, writing "This is greenish — what can you tell me about what that means?" The letters sometimes included questions about intimate matters, like birth control and abusive husbands — "really treating the Children's Bureau women as distant relatives," Ladd-Taylor notes. Today the law is acknowledged as "a landmark in the development of social welfare programs in the United States," according to the U.S. House of Representatives website. "Julia Lathrop really clearly believed that these kinds of health education programs should be universal programs — available to everybody," Ladd-Taylor says. "Not a charity. An entitlement for citizens." The law was repealed in 1929, and Julia Lathrops' dream of accessible health care for all women and children was slipping away, too. Still, Lindenmeyer says the Children's Bureau under Lathrop created a powerful, lasting legacy in the U.S. — the idea that every child has a right to childhood. "That every kid has a right to dependency," she says. "That they don't have to support themselves, and that the government is the parent of last resort if everything else fails." She contacted a doctor in the region to pay a visit to Phelps at home. And when it came time for Phelps' baby to be born, Lathrop made sure she delivered the child in a hospital. Phelps later wrote to Lathrop with the good news that she'd given birth to "a darling of a baby" — an 8-and-a-half-pound blue-eyed boy. What that healthy baby couldn't have known is that Julia Lathrop paid for his hospital birth, not out of her slender federal budget, but out of her own pocket. NPR intern Menaka Wilhelm contributed to the researching of this story. On this holiday weekend, it's a time to relax and step back from the frantic news cycle, a perfect moment for us to kick off something we're calling The Weekendlong Listen (ph), stories by reporters on the ground that take you somewhere, stories we're airing throughout the summer that, yes, you just have to listen to. This morning, let's turn back the clock about a hundred years, when parents were in desperate need of advice for taking care of their kids. But there were no parenting books, no YouTube, no social media like today. Nope. They wrote letters to, of all places, the United States government. As part of NPR's series How To Raise A Human, Rebecca Davis tells us how this helped us rethink what it means to be a kid. UNIDENTIFIED PERSON #1: (Reading) I live 65 miles from a doctor, and my other babies were very large at birth - one 12 pounds, the other 10 1/2. I have been very badly torn each time. DAVIS: Julia Lathrop was used to getting letters from mothers eager for advice. She was director of the United States Children's Bureau in Washington, D.C., but Alice Phelps's letter made an especially deep impression. She lived on a ranch in Wyoming and described riding miles through subzero temperatures to help a distant neighbor, a woman in the middle of childbirth. UNIDENTIFIED PERSON #1: (Reading) She was nearly dead when I got there and died after giving birth to a 14-pound boy. I am so worried and filled with perfect horror at the prospects ahead. If there is anything I can do to escape being torn again, won't you let me know? DAVIS: Julia Lathrop heard this cry for help, but what could she do? Her agency wasn't designed to provide health care. In fact, it had very few resources. And it was created with a narrow mission - to conduct research. Historian Kriste Lindenmeyer says that's because the Children's Bureau was created out of an idea that was still very new at the time, that the federal government would have a role in the welfare of children and families. Lindenmeyer wrote a book about the Children's Bureau called "A Right To Childhood." KRISTE LINDENMEYER: The federal government had dealt with economics. It dealt with trade, had dealt with building roads and bridges and things like that but certainly not social welfare issues. DAVIS: By the late 1800s, the U.S. and the needs of its citizens were quickly changing. The population was growing. Millions of immigrants had entered the country. And Kriste Lindenmeyer says more people were living in cities. LINDENMEYER: Americans thought of their country as a very modern and industrializing country - in fact, the model for the rest of the world. DAVIS: A model on the one hand. But, in reality, many people's lives were a downright struggle. LINDENMEYER: Poverty, poor sanitation, ignorance of modern health practices, parents who don't have access to good care or information. DAVIS: And child death was a fact of life. Historian Molly Ladd-Taylor wrote the book "Raising A Baby The Government Way: Mothers Letters To The Children's Bureau." She says that in 1915, 1 out of 10 white infants and 1 out of 5 African-American infants died before their first birthday. MOLLY LADD-TAYLOR: Babies died in the summer. There was nothing to do. That's just - it was God's will. Babies died. To try to change that is changing nature. LINDENMEYER: Children are a resource, a national resource. If we don't do something to help the next generation thrive, what's the future of the country? DAVIS: And they were mad that the federal government had spent tens of thousands fighting the boll weevil and yet had done nothing about the deaths of children, which sometimes topped 300,000 a year. LINDENMEYER: So there began this movement calling for the establishment of a federal agency that would focus solely on the needs of the nation's children and youth. DAVIS: In 1912, the United States Children's Bureau opened its doors with Julia Lathrop as its first director. She soon commissioned several studies that investigated the causes and conditions of infant mortality. Lathrop wanted to dispel some common ideas of the time - that child death was inevitable, an act of God, the fault of defective parents. Her studies showed that, in fact, children often died from things that could be prevented, like contaminated milk and water or poor nutrition, things many parents didn't know about or didn't have the money to do something about. So the Bureau published a series of advice pamphlets on infant care. And soon, women were writing to the Children's Bureau by the thousands. DAVIS: And women wrote about personal matters, like birth control and abusive husbands. LADD-TAYLOR: Really treating the Children's Bureau women more as kind of distant relatives. LADD-TAYLOR: ...How much women wanted health care for themselves and for their children. DAVIS: So Lathrop pushed for passage of a new law, the Sheppard-Towner Maternal and Infancy Protection Act (ph). The act funded state programs that dispatched health care workers, especially to rural communities. It set up nearly 3,000 prenatal clinics. It was the first federal effort of its kind. LADD-TAYLOR: Julia Lathrop really clearly believed that health education programs should be universal programs, an entitlement for citizenship. DAVIS: But the Sheppard-Towner Act had many influential critics who saw this federal program as a step towards socialism. The act was repealed in 1929. Julia Lathrop's dream was slipping away. But Kriste Lindenmeyer says the Children's Bureau under Director Lathrop created a powerful legacy that every child has a right to childhood. LINDENMEYER: That every kid has a right to dependency, that they don't have to be able to support themselves and that the government is the parent of last resort if everything else fails. DAVIS: As for Alice Phelps, the pregnant ranch wife, Julia Lathrop did figure out a way to help her. When it came time for Phelps's baby to be born, Lathrop made sure she delivered in a hospital. Mrs. Phelps later wrote to Lathrop to say she'd given birth to a darling of a baby, an 8-and-a-half-pound blue-eyed boy. What that healthy baby couldn't have known is that Julia Lathrop paid for his hospital birth not out of her slender federal budget but out of her own pocket. Rebecca Davis, NPR News, Washington.